Max Martin lyrics are silly: from Britney Spears and the Backstreet Boys to Ariana Grande’s Break Free, his most ungrammatical lines. 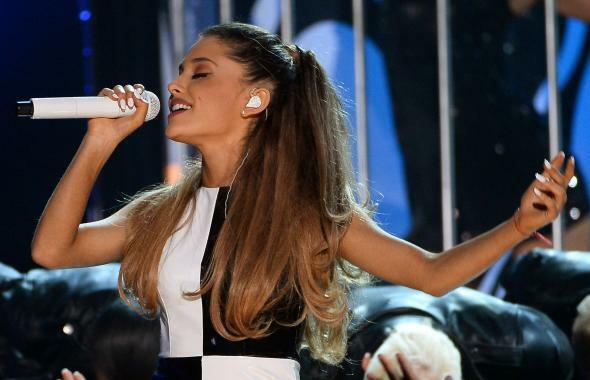 It’s not Ariana Grande’s fault her lyrics don’t make sense. Ariana Grande's lyric "Now that I've become who I really are" is the new "Concrete jungle where dreams are made of"
Grande’s voice trails off a bit, so it’s hard to tell whether she’s fudging the conjugation of “to be” for the approximate rhyme, or perhaps trying to say “am” in such a way that it almost, somehow, rhymes with “heart.” But even if we let her off the hook for that one, the song gives us more baffling lines to chew on. “I only want to die alive,” she belts, “never by the hands of a broken heart.” Where to begin? That it’s impossible to die alive? That hearts don’t have hands? The grammatical bar for pop lyrics is plenty low, but some effort, at least, is required to clear it. And while we are fairly forgiving when it comes to the grammar of pop songs, we expect them at least to be fairly idiomatic most of the time. The lines above don’t sound like someone who’s careless about grammar. They sound like someone who is not a native English speaker and is also careless about grammar. As it happens, the man behind many of the mega-hits of the last two decades, and also this song, is writer-producer Max Martin, who is from Sweden. Martin co-wrote and produced dozens of hit singles for Britney Spears, ‘N Sync, the Backstreet Boys, Pink, and Katy Perry, among other Billboard chart-toppers. And a number of his co-writers—Andreas Carlsson, Jorgen Elofsson, Per Magnusson, David Kreuger, Denniz Pop—also hail from the land of ABBA and lingonberries. Martin and his compatriots aren’t the only songwriters churning out lyrics with occasionally head-scratching foreign syntax. Owen Pallett wrote a few months ago in Slate about the “specifically Francophonic idiosyncrasy” in Daft Punk’s use of the word “good” in “Get Lucky.” But a look back through the Martin catalogs yields a veritable treasure trove of lyrics that your third-grade English teacher would shake her head at. Now, since Martin often works with co-writers, it can be difficult to tell which specific lyrics he is personally responsible for. But he is the common denominator in all this lyrical clumsiness. And so, below, we’ve rounded up some of our favorite ungrammatical, unidiomatic, or just plain awkward lines from songs by the Swedish hitmaker. “Quit Playing Games (With My Heart),” Backstreet Boys, 1995. Written by Max Martin and Herbert Crichlow. “We’ve Got It Goin’ On,” 1996, Backstreet Boys. Written by Denniz Pop, Max Martin, and Herbert Crichlow. “(You Drive Me) Crazy,” Britney Spears, 1999. Written by Jorgen Elofsson, Per Magnusson, David Kreuger, and Max Martin. “Shape of My Heart,” Backstreet Boys, 2000. Written by Max Martin, Rami Yacoub, and Lisa Miskovsky. “Bigger,” Backstreet Boys, 2009. Written by Max Martin, Shellback, and Tiffany Amber. “Outta My Head,” Leona Lewis, 2009. Written by Max Martin and Shellback. “First Love,” Jennifer Lopez, 2014. Written by Max Martin, Savan Kotecha, and Ilya Salmanzadeh. “Break Free,” Ariana Grande featuring Zedd, 2014. Written by Anton Zaslavski, Max Martin, and Savan Kotecha.